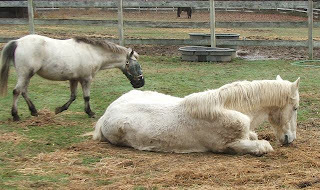 When we first put Nathan in the same paddock as Butternut, he took his role as "Blind Pony Guardian" very seriously, never letting Butternut out of his sight. Now, the relationship is maturing into more of a partnership. Nate is more relaxed about Butternut's well-being and has resumed his morning naps while Butternut takes over patrol duty.